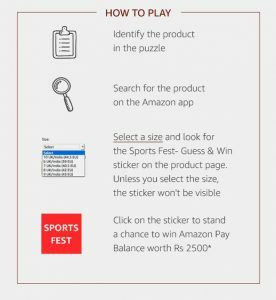 Amazon Sports Fest | Guess & Win Rs. 2,500 Amazon Pay Balance. Guess the correct products & Claim it and Get Chance to Win Rs. 2,500 Amazon Pay Balance. This is Amazon App only contest. 4. There will be total 25 Puzzles, You just have to solve the puzzle & Find the correct product. 5. Find the correct product and Click on Claim button. 6. Done. Congratulations !! You are eligible to Win Rs. 2,500 Amazon Pay Balance . Note: Total 25 Puzzles to be solved which means you need to find out 25 Correct Products in Amazon App. You are now eligible to win Rs. 2,500 Amazon Pay Balance from Amazon India. This Contest will be valid only on December 3, 2017 from 12:00:01 a.m. (IST) to 11:59:59 p.m. (IST) (“Contest Period”). (vi) Find and click the contest tag on that page. For the purpose of these T&Cs each such person shall hereinafter be referred to as a “Participant”. At the end of the Contest Period, amongst all Participants who complete the steps mentioned in Section 2 and identify the product correctly, 100 Participants will be selected by a draw of lots, as winners of this Contest in accordance with these T&Cs. 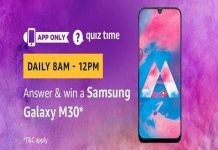 Each winner under this Contest will be eligible to receive one Amazon Pay Balance worth INR 2500 (“Prize”) provided at the sole discretion of Amazon. 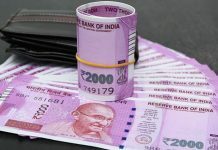 Once the winners are selected, they will be credited INR 2500 (“Prize”) in their Amazon Pay Balance account, in their respective registered account. 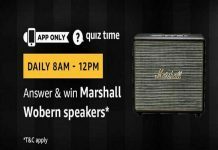 Each winner will be entitled to receive only 1 Prize under this Contest during the Contest Period i.e. the first time he/ she successfully identifies the product as per Section 2 above.